Things to do in Columbus on Labor Day Weekend is about what's happening around town. Around town being events in Columbus, Lewis Center, the Short North, OSU campus, Clintonville, Worthington and more. A link to the ’365 Things to do in Columbus Ohio‘ page on Facebook is currently in the sidebar here, there is another page with a similar name. The URL to the ’365 Things to do in Columbus Ohio’ FB page related to this site is http://www.facebook.com/365Columbus OK? And before I forget…. “Where are the best flea markets in Columbus?” For that matter where are there flea markets in central Ohio? Someone asked on ’365 Things to do in Columbus Ohio’ on Facebook yesterday. I don’t think I have been to a flea market in Columbus. Unless you can count the yearly markets (I think in May or June) on the Worthington Village Green… and those are NOT Labor Day Weekend 2012 or anytime soon. Labor Day Weekend 2012 – It’s Football Friday night and Saturday afternoon. Others? There are football games all over central Ohio on Friday night. Do you go to high school football games? Who do you support? 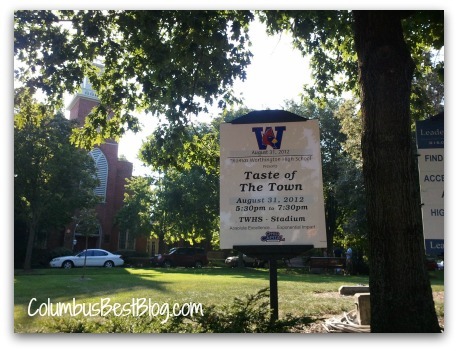 Friday Night in Worthington is Taste of the Town at Thomas Worthington High School Stadium, the sign on the Worthington Green says so. Chris Bradley on Channel 10 TV weather says Isaac should NOT be here for the OSU game. A thing to do both Saturday and Sunday is watch “gentlemen” play baseball… or is it base ball? Did you know there is a baseball tournament in town? More than just the Muffins playing at the Ohio Historical Society this weekend. Did you know it is FREE? I did not know until Nick Herold of The First Bexley Bank let me know via email. As long as I have known Nick, this sport and “base ball” team has been his passion. 30 Vintage Base Ball Teams, playing circa Civil War era, from Pennsylvania, Illinois, Michigan, New York, Indiana, Minnesota, Missouri and throughout Ohio will play the grand and glorious game of base ball by the rules of 1866. Games start 9:00am – 5:00pm both Saturday & Sunday, September 1st & 2nd. Great Family Fun… and here’s more family fun. This weekend is St. Michael’s Parish Festival… I am going to do something I seldom do on this site. Link to a Facebook page… Here’s the St. Michael’s Parish Festival Facebook page! Lots of details about what is happening Labor Day Weekend at the St. Michael’s Parish Festival. Labor Day is the Upper Arlington Arts Festival. Saturday is the 1st so that means this Saturday is Gallery Hop in the Short North! What are you doing in Columbus this Labor Day weekend? If you need ideas, http://www.ExperienceColumbus.com is always a great resource. If you know of things to do this weekend, or in the future and you would like to share them with others, share them on ’365 Things to do in Columbus Ohio’ on Facebook.